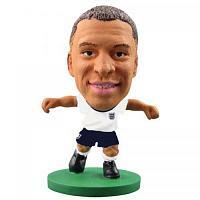 SoccerStarz football figures are a new addition to the squad here at Official Football Merchandise.com. You can choose SoccerStarz football figures for all your favourite clubs & teams. These uniquely crafted player sculptures are perfect for collecting but also they are actual figures you can touch, share, swap and display. SoccerStarz football figures are beautifully crafted miniature football figures and a great deal of attention has gone into player likeness, which is as accurate as possible so that players are instantly recognisable. Order your SoccerStarz football figures with us today.